There is ample evidence that African Americans in Grand Rapids have always been the target of intimidation, harassment and violence from law enforcement. This history plagues the black community today, with recent incidents of police traumatizing black youth who were being held at gunpoint by the GRPD or the recent study acknowledging the disproportionate racial profiling of black drivers by those same cops. If one reads either African Americans in the Furniture City (Jelks) or A City Within a City (Robinson), it is easy to see that the black community in Grand Rapids has experienced a great deal of harm from the GRPD, from the end of the 19th Century through the present. Another example of this reality, can be found in 1970, when several members of the African American community submitted a position paper on April 30th of that year, to the Grand Rapids City Commission. Based on a short article in the Grand Rapids Press, we know that some of the demands from the black community were that the city should hire a black aide to Police Superintendent Robert Anderson, the withdrawal of the police tactical unit from the inner city until an investigation of alleged police brutality is completed and a request that any time there is a request for a cruiser in the black community, if there are no black policemen available, do not send any. Now, it is important to put these demands into context. First, the 1967 riot in Grand Rapids, was initiated when police used excessive force against several black youth after pulling them over in what was believed to be a stolen car. For the next three days, the City of Grand Rapids became highly militarized by law enforcement agencies, including the GRPD, the Michigan State Police and members of the National Guard. 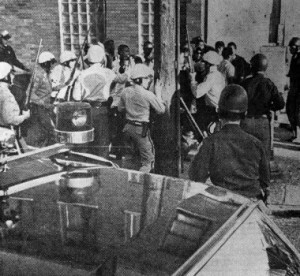 People were shot at by the police during the riot, One hundred and eighty African Americans were arrested during the 67 riot, mostly for curfew violations. The City of Grand Rapids imposed a curfew, which was primarily enforced in the near southeast part of the city, which is documented in the City’s document called, Anatomy of a Riot. In other words, the demands from the Grand Rapids black community was fairly consistent with the rest of the black community around the country, based on the lived experience of black people as targets of police violence. Unfortunately, the Press does not explore more about the demands and what it meant at the time. Instead, the Press reporter chose to focus on tensions between those who presented the demands, 3rd Ward Commissioner Lyman Parks and Franklin Gordon, director of the department of Community Relations.In fact, roughly two-thirds of the article was devote to these “conflicts,” instead of exploring the demands from the black community that challenged police presence and police violence in black neighborhoods. This entry was posted in Civil Rights/Freedom Movement and tagged 1967 riot in Grand Rapids, police violence in Grand Rapids, the black community makes demands on the GRPD. Bookmark the permalink.